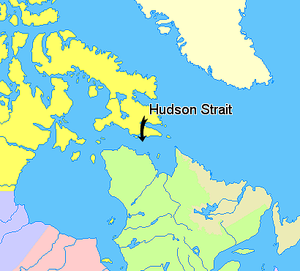 Hudson Strait links the Atlantic Ocean to Hudson Bay in Canada. It is between Baffin Island and the northern coast of Quebec. Its eastern entrance is Cape Chidley and Resolution Island. It is 450 mi (720 km) long. Its width varies from 150 mi (240 km) at its largest point, to a minimum of 40 mi (64 km). The strait was discovered by explorer Henry Hudson in the year 1609. It was long thought to be the fabled Northwest Passage. ↑ Trémaudan, Auguste Henri de Trémaudan (1916). The Hudson Bay road (1498-1915) (Digitized Jul 10, 2008 ed.). J.M. Dent. p. 50. This page was last changed on 31 August 2017, at 03:34.